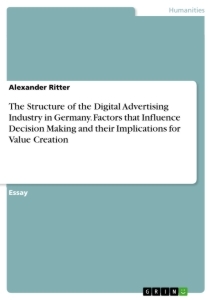 This essay aims to analyze decision making in the field of digital advertising in the German market. In order to do this effectively, the structure of Germany’s digital media industry will be analyzed, with a particular focus on the relationship between companies, their agencies and third party service providers. The role of these actors with regards to the value chains of companies’ marketing efforts will be assessed. Moreover this essay aims to address the common factors that lead to inefficiencies in digital media decision making, which are often rooted in the structural relationship between the various players in the industry (e.g. asymmetry of information), the mismatch between mission statements and actual business conduct within agencies and service providers. The author will assess the possibility of ‘best practices’ in the conduct of digital media decisions and use empirical examples to which extent these decisions were aimed at maximizing the return of client investment. Finally, the author will provide normative suggestions for companies that engage or plan to engage in digital media and marketing activities that aim to improve the return of investment. The author will not disclose the real names of former contractors and reserves the right to change the names of companies for the sake of trust and legality. As a digital marketing expert, working in various positions at start-up in digital advertising, at a company builder, as a consultant at a leading media-agency and most recently as a digital marketing consultant and start-up entrepreneur in that field, I have often experienced how unfounded decision making with regards to digital advertising can lead to mediocre results for clients respectively advertisers. Even as there are not many industries that exhibit better preconditions for the implementation of evidence-based-management (EBM) as there are many ways to collect online data and innovative technologies that enable companies to utilize that data, I have rarely witnessed that companies make full use of these opportunities. As Pfeffer and Sutton (2006) argue, it is time that companies and leaders root their decision-making in solid evidence to ensure optimal utilization of resources. Rousseau (2005) defines EBM as a practice that integrates best available evidence with decision-making expertise, aimed to satisfy client- expectations and guided by continuous improvement. However, EBM, which has historically been developed and applied in the health-care sector (Walshe & Rundall, 2001), is not a list of techniques that can be mechanically applied across various contexts but rather a philosophy on what the company knows/does not know, what is working/not working and what to do next (Pfeffer & Sutton, 2006). The literature on EBM suggests that EBM is still not widely used in companies, which has to do with a resistance towards change and simple unawareness of the benefits that EBM offers. Translating the principles of EBM to the specific case of digital advertising, the advertising company (the advertiser) must establish the necessary preconditions to gather data and use the data in the most efficient and most effective manner in order to maximize their return of investment (ROI) from their digital advertising activities. In reality, however, many advertisers are not fully aware of the technologies that enable them to gather and utilize data from their digital advertising activities or they lack the expertise and manpower required for the execution. Such advertisers usually rely on the expertise of (digital) media- agencies to consult them and manage their digital advertising efforts for them, including strategy and media-buying. This essay aims to address the structural and operational inefficiencies that are prevalent among advertisers that engage in digital advertising nowadays. Furthermore, this essay is directed at advertisers and their decision-makers in digital marketing/advertising, advocating to apply EBM-principles in order to achieve transparency within the structural relationships between advertiser and service providers (and media-agencies in particular). In addition to this, the potential benefits of data-driven behavioral targeting compared to traditional targeting will be assessed. The structure that is prevalent in the ‘digital advertising industry’ (meaning the various players that engage in trade related to digital advertising) will be assessed based on the principles of the principal-agent theory, originally developed by Akerlof (1970), dealing with the inefficiencies that result from asymmetry of information in a business context. Three hypotheses will be raised in the Popparian manner that will address the specific problem of asymmetry of information between principal (here the advertiser) and agent (here the media-agency), that assuming rational actors would always lead to a relatively inefficient outcome for the principal (advertiser). The effectiveness and therefore the ROI-maximizing potential of data-based behavioural targeting will be compared to traditional interest-based targeting, both in theory and in practice. This will be done by performing a descriptive statistical analysis on a set of past campaigns in which both data-based behavioural targeting and traditional interest-based targeting were used. For this purpose, a Popparian hypothesis (H4) will be raised where possible falsification is dependent on the outcomes of the statistical analysis, specifically the result of the correlations of H5 - H8. This essay may potentially contribute to the adoption of evidence-based principles by advertisers that engage in digital advertising. What is meant by the term ‘digital advertising’? Digital advertising has developed into a broad field that needs to be differentiated from digital marketing, which is even broader as it incorporates no only so-called OnPage-activities (namely marketing activities that happen on the company’s website, such as search-engine-optimization, usability, user-experience etc.) but also the media aspects. All digital media aspects that a company engages in can be summarized under the term ‘digital advertising’. The most common digital advertising activities are search engine advertising (SEA), social media advertising (SMA), video advertising, display advertising, mobile advertising and native advertising. Digital advertising always happens when a company uses a digital vehicle outside of its own website to convey a commercial message to a recipient (the designated target group) through an internet- ready device (such as computers, smartphones, tablets, smart-TVs, etc.). The most important innovation of the past decade has been the invention of programmatic advertising, more specifically the development of real-time-bidding, the near real-time trade of digital ad inventories online that is facilitated through an auction based system. The digital advertising industry - i.e. the network of stakeholders that uses digital advertising as a value-adding activity - is generally structured as follows: There are companies that use digital advertising as part of their marketing-mix, which constitute the demand side and are labelled ‘advertisers’. The supply side consists of vendors for advertising spaces, which is made up of large publishing houses as well as independent website owners. Between these two camps there is a set of service providers that add value by matching the demand side with the supply side in digital advertising, which makes the trade between both parties more efficient. Other intermediaries add additional value by refining the advertising inventories with user data. Among the service providers, the media-agencies are usually the first and foremost contactors for the advertisers. The core function of media-agencies is to negotiate discounts with large publishers as they bundle advertiser demand and therefore are more capable of achieving larger discounts than each advertiser on its own. In addition to media-buying, the media-agency consults the advertiser in media strategy and plans as well as executes the advertisers’ digital advertising campaigns. In Germany, there is an oligopoly situation as four large agency networks (WPP, OmnicomGroup, Dentsu Aegis Network and Publicis Groupe) control around eighty percent of the market share. Furthermore, there are advertising networks such as Ströer Digital, Hi Media and others that both exclusively and non-exclusively market parts of the large publishers’ ad inventories (usually remainder inventories) as well as those of private websites. Evidently, the ad networks consolidate the supply side. Furthermore, there have been numerous IT-companies that have disrupted the digital advertising market most profoundly by connecting demand and supply for ad inventories in the most efficient manner. Demand-Side-Platforms (DSPs) allow the demand side to directly buy or bid on ad inventories that are sold by publishers and websites through Sales-Side-Platforms (SSPs). The ad inventories that are auctioned off in a real-time-bidding (RTB) principle are trades in the so called AdExchange according to the principles of the Vickery auction, therefore leading to highly efficient market outcomes as prices reflect the forces of supply and demand. The full potential of RTB has not yet become clear as publishers are reluctant to auction of their premium ad inventories as they fear this would decrease their total revenues. Surprisingly, not yet many advertisers have made the step to invest in an account with a DSP, however most (digital) media- agencies have. Additional important market players are ad server providers (that allow for the precise tracking of digital advertising campaigns), ad verification technology providers (that allow ad inventories to be analyses for their quality) as well as data collection companies (that enrich ad inventories with relevant user data). Generally, it can be noted that companies that see value in digital advertising but lack core competencies in that area tend to employ a media agency for media-buying, consulting and operational purposes (i.e. implementing and executing digital advertising campaigns). The traditional argument for delegating media-buying decisions to media-agencies is their positioning as a multiplier of demand, as they act on behalf of multiple clients, thereby exhibiting greater power over the publishers. Moreover, the media-agencies have greater knowledge on price- structures, thereby being more effective in negotiations as well as recognizing a “good price” from a “bad price”. The digital advertising ecosystem also becomes increasingly complex and fragmented over time. Companies would therefore need to invest and build expert teams of similar size to those working for media-agencies, in order to build similar expertise in the field of digital advertising. According to Lutz von Meyer (Brandeins, 2014), the trend even suggests otherwise, with businesses in Germany being reluctant to invest in their media expertise. An important criteria with regards to outsourcing of digital media competencies versus forward integration, has to do with the degree of embeddedness of the digital value chain into the general value chain of the company. All companies must be profitable in order to survive. All shareholders of companies require the companies they own to maximize their profits. All media-agencies will use asymmetry of information to their clients’ relative disadvantage (compared to perfect symmetry of information). Hypothesis H1 can be falsified by finding that some state-owned businesses do not need to operate at a profit in order to survive, as they are funded by tax revenues. Hypothesis H2 can be falsified by finding a shareholder that does not require a company to maximize profits. This could be the case with an NGO or a charity of some kind.